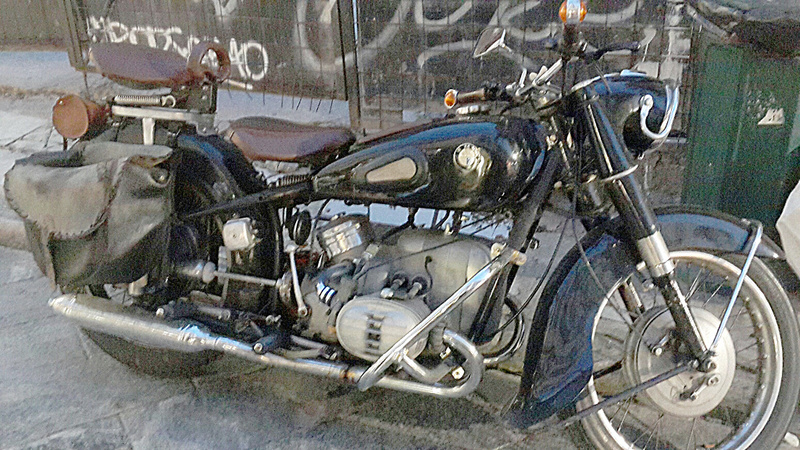 It was getting dark in Athens, Greece when John happened upon this old BMW. He took a picture and sent it on, knowing I would like it. Not quite steampunk, but oozing character and timeless durability and utility. Right away, I wondered “What is it?” I could see the BMW emblem on the tank. John had called it a BMW. It has the horizontally opposed twin engine that certainly looks BMW. Beyond that, however, I was clueless. I knew from the front drum brake that it had to be old, but how old? Straight to Wikipedia via Google and, sure enough, this grand old relic appears to be a genuine BMW production bike from the 1960’s. 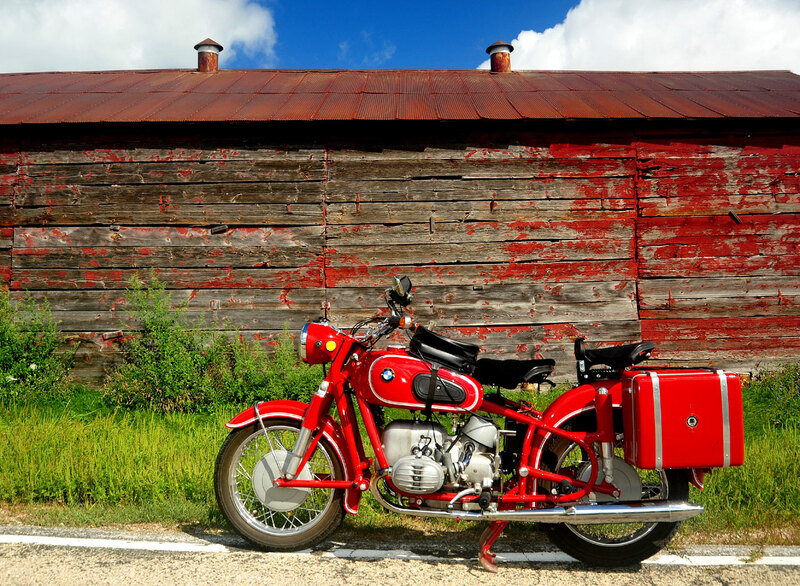 Above is a Wikipedia photo of a 1967 BMW R60/2. Notice the distinctive circular passenger hand hold like the one on the Athens bike. The front fender on the Athens bike appears to be from a different motorcycle. It’s bulkier, wrapping around the tire more than the original design. 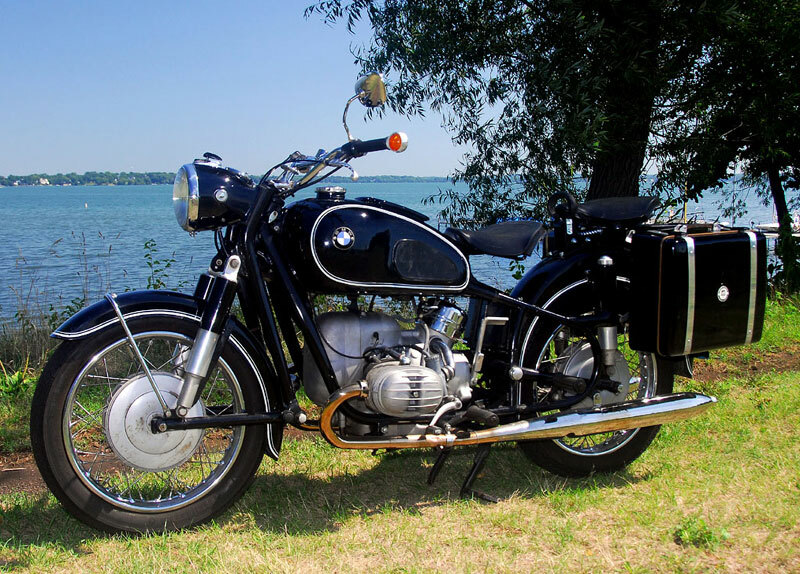 According to the article BMW was transitioning from the Earles fork to a more standard telescoping fork in the late 1960’s and some R60s had the Earles and some had the telescoping fork like the Athens bike. The Earles fork was especially appropriate for sidecars, but sidecars were in decline at the time and customers wanted the more modern, telescoping fork. Out of curiosity, I looked up the R60/2 in the parts catalog at maxbmw.com and you can still get parts for it from BMW, although a cylinder will cost you $916. A complete gasket and seal set for the engine is $142. The availability of old parts is a huge recommendation for BMW, in my opinion. A recent project built an entire, brand new, 1970’s era BMW R90/6 9 about 99.8% from parts available from BMW. I noticed a fully restored R60/2 for sale on cycletrader.com for $32K. That Athens bike has to be worth a lot more than my initial impression!